Should I Include Medicaid Planning in My Long-Term Care Planning? For 2019, the Federal estate tax exemption amount—the amount that you can pass free of federal estate taxes—is $11.4 Million. This tax law is set to expire on December 31, 2025 and revert to prior the prior level of $5 Million indexed for inflation. The estate tax exemption can also be changed by Congress at any time. As a result, it’s prudent for high net worth individuals to establish estate tax planning to “lock in” the currently high estate tax exemption before the rules change again. The applicable estate tax rate on assets in excess of the estate tax exemption is 40%. For example, if your total estate is $12.4 Million, your estate tax exemption can be used to shelter the first $11.4M from estate tax (assuming you didn’t use your exemption during lifetime—see below). The remaining $1M would be taxed at 40% resulting in a $400,000 estate tax bill. North Carolina repealed the state-level estate tax effective January 1, 2013. Keep in mind that the Estate Tax Exemption and the Lifetime Gift Tax Exemption are linked together. Any portion of your Lifetime Gift Tax Exemption used will reduce your available Estate Tax Exemption upon death. For example, if you use $2M of your lifetime gift tax exclusion during your lifetime, then upon death your estate tax exemption amount will be reduced by $2M. When the estate tax was first created, many affluent families (e.g., the Rockefellers, Vanderbilts, etc.) began using trusts to shelter assets from estate taxes for multiple generations by setting up their estate plans such that some assets would “skip” their children and pass directly to grandchildren or younger beneficiaries. Here’s how it would work: Grandpa realizes that then he leaves his estate to his children, it will be subject to estate tax. And then later, when Grandpa’s children die and pass the wealth down to the grandchildren, it will be subject to estate tax again (as part of the child’s estate). So Grandpa decides that he has enough wealth that he will just leave part of his estate to his children, and then for the rest of his estate he’ll “skip” his children and leave it directly to the grandchildren, thereby sheltering the money from being taxed as part of the child’s estate. Congress eventually got tired of these generation-skipping shenanigans and added the Generation-Skipping Transfer Tax to the law books. Essentially, if you leave assets to grandchildren or younger beneficiaries in an effort to “skip” a generation of estate taxes, there is a secondary tax that kicks in to make it as if you had paid estate tax at each generation. The Federal generation-skipping transfer tax (GST Tax) exemption is currently the same as the estate and gift tax exemption: $11.4 Million. Need to Discuss Your Tax & Asset Protection Planning? You own a business with significant value. Don’t leave yourself or your loved ones stuck dealing with the financial aftermath of avoidable taxes, a lawsuit, long-term care costs, or an unexpected tragedy can bring to your family. Contact Carolina Family Estate Planning today at (919) 443-3035 or fill out our online form to speak with someone about registering for a seminar or a Vision Meeting. 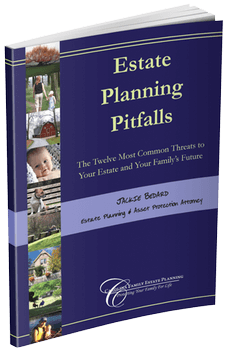 You may also wish request a free copy Jackie Bedard’s book, Estate Planning Pitfalls: The Twelve Most Common Threats To Your Estate & Your Family’s Future.